I lose my appetite when it gets hot. I go about my day, soaking up the sunshine and sipping iced coffee and then, before I know it, it’s 4 PM and I’m starving and way too weak and overheated to turn the oven on. Enter this easy, fresh and light dinner. Ready in 20 minutes, healthy and full of great flavors and textures. Serve it with rice or noodles if you want but it’s lovely on its own. Combine cilantro, parsley, mint, jalapeño, garlic, juice of 1 lime and 2 tbsp olive oil in a food processor or blender. Pulse until smooth. Season with salt and pepper to taste. Set aside. Sprinkle shrimp with soy sauce. Toss to coat. Heat remaining olive oil in a medium frying pan over medium-high heat. Add shrimp and cook, stirring occasionally, until just pink and firm. Remove from heat. Toss shrimp with pesto mixture and transfer to serving platter or individual plates. 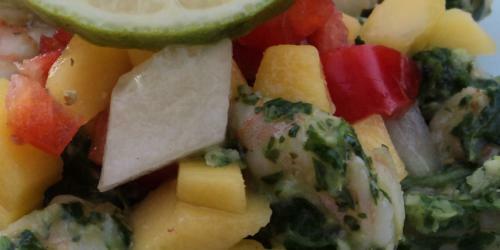 In a medium bowl, combine mango, cucumber, red bell pepper, remaining lime juice, salt and pepper to taste. Mix until well-combined. Top shrimp with mango mixture. Serve immediately or chill and serve cold. The thing about Chinese cooking is that it’s really versatile and quick. The most essential parts of this recipe are the shrimp, oil, and cornstarch. Everything else is a nice to have. If you think about it this way, everything is simple and quick. Some may be surprised that cornstarch is one of the essentials. It keeps the shrimp from getting rubbery. Great essaydune.com – recipes source. Follow blog.